This instrument is stored in a box decorated with studs and masks. It is made up of two graduated legs which can open, joined by a semi-circular arc of circle. The case also contains some accessories, including a Cardan suspension compass (incomplete), a plumb-rule and others. These could be mounted on the instrument as desired to allow numerous operations to be carried out, including the measurement of angles, the calculation of heights, and calculations of elevation in general. 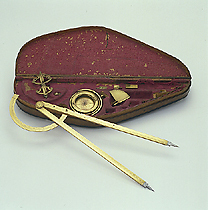 The instrument, signed by Paolo Massucci, from Lucca, belonged to the Medicean collection of scientific instruments.